As medical science advances rapidly, clinical trial designers and biostatisticians need to keep abreast of current methodological developments. As the literature is so vast and journals are published so frequently, it is difficult to keep up with recent developments, Many of these come from the pharmaceutical industry and not so much from academic institutions. The goal of this short course is to summarize and impart the recent developments in clinical trial methodology to participants who already have some knowledge on the basic principles of clinical trials and of the statistical methods for their analyses. This short course provides a comprehensive summarization of recent developments regarding methodologies in clinical trial design and analyses. It covers important topics in early-phases of clinical development such as Adaptive Designs for phase II and III designs. Faculty: The faculty who have participated in such trials that dealt with recent developments will share their experiences. 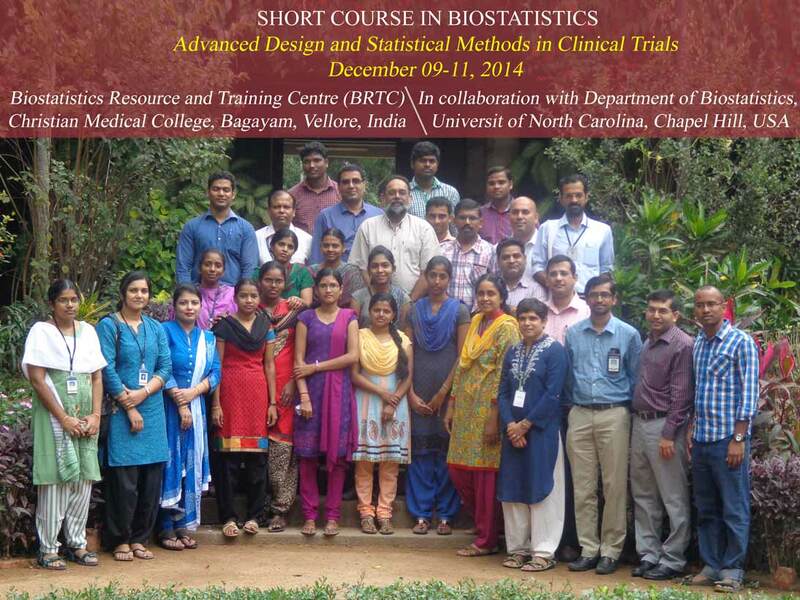 The rich research experience from the Department of Biostatistics of the University of North Carolina at Chapel Hill, USA and from the Christian Medical College, Vellore, India will be present. Who: The medical doctors and statisticians who have attended a basic clinical trials design and analysis course at CMC-Vellore or elsewhere should apply. Participants will have to bear their own expenses for travel, boarding and lodging. The Organizers will give Course kit, Lunch and Snacks. However the organizers may arrange basic accommodation with A/C facility in the college campus on request, from Nov. 30 to Dec. 17, 2014 only. However, no rooms are available from Nov. 16 to 28, 2014. (during Fundamentals of Biostatistics., and MLR, & Logistic regression.. course). Only limited accommodation available in the campus and priority will be given to the female participants on first come first served basis. Others, they may have to book the rooms directly to the hotels. The list of hotels are available in the website. Course Fee should be paid in full by November 10, 2014.